While everyone heads to the Tidal Basin, hit up one of these spots! It's getting warmer, Metrorail is standing room only and "escalefters" (those who stand on the walking side) are clogging the escalators. Ah, it must be cherry blossom season. As thousands of people flock to the Tidal Basin to see the blossoms in peak bloom, consider one of these alternative locations for an uninterrupted view. American University in Northwest D.C. also serves as an arboretum and is home to more than 75 different tree species, including the Korean Cherry. The trees were planted in 1943 outside of the old School of International Service, now renamed as the East Quad Building, blooming each year as a plaque testifying to the AU-Korean friendship. Anacostia Park offers a view of the blossoms along the Anacostia River. The National Park Service and the 11th Street Bridge Park are hosting the second annual Anacostia River Festival on Sunday, April 17, the official closing program of the 2016 National Cherry Blossom Festival. The free event will feature activities including kayaking, boating, fishing workshops, art projects, music and a bike parade (although the cherry blossoms themselves will be long gone by then). Historic Dumbarton Oaks in Georgetown is one of the most scenic areas in the city. Formerly home to Robert Woods Bliss and his wife, Mildred, the estate and the garden make for a perfectly lovely, perfectly tucked-away place to view the blooms. Foxhall Village, slightly northwest of Georgetown, is a secret spot where locals like to take in the blossoms. Yoshino cherry trees line most streets, but Surrey Lane features Quanson cherry trees that blossom slightly later than trees around the Tidal Basin. The Kenwood area in Chevy Chase is (quietly) renowned for its beauty during cherry blossom season. Locals say this is one of the best, least congested ways to take in the cherry blossoms. The Meadowlark Botanical Gardens in Northern Virginia has a number of walking paths that circle around beautiful lakes surrounded by cherry trees. The flowering trees at Lake Caroline echo the scene of the blossoms along the Tidal Basin. Montrose Park is a well-kept secret in Georgetown just a few steps from Dumbarton Oaks. The park is publicly owned and chock full of open space and beautiful trees. Stanton Park, a four-acre park located in Capitol Hill, is surrounded by cherry trees. Busy streets run nearby, but the park offers a play area, walkways and a grassy area perfect for a spring picnic. The U.S. National Arboretum is not just a primo locale to check out the cherry blossoms; this botanical research center is also home to several other varieties of shrub and floral life. For the botany buffs, an open-air tour will give you the history and habits of the arboretum's blossoms. Washington National Cathedral is one of D.C.'s most awe-inspiring structures. The beautiful neo-Gothic design makes it a wondrous place to just sit and exist any time of year, but during the spring when the cherry blossom trees are in full bloom, the cathedral's other-worldly beauty becomes even more apparent. 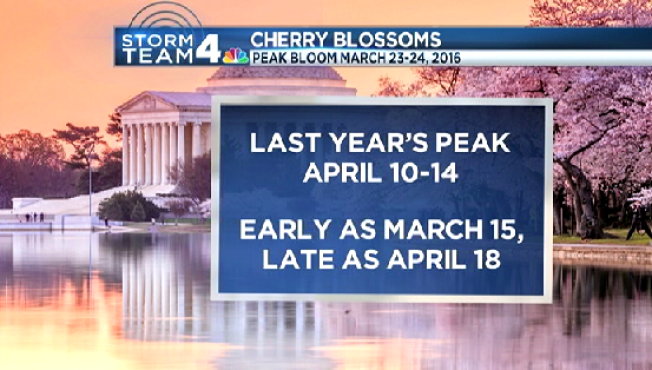 We're collecting the best of the best cherry blossom pictures to post to our site, so tweet your best cherry blossom snaps to @NBCWashington with the tag #cherryblossoms.